Hi trying to get a bus from Acantilados de Gigantas to Los Cristianos on a Sunday. I have found a477 to get me back but can’t find a bus there ! Can you help please? Can we buy bono bus passes at tenerife South airport? Can you tell me which bus to get from Tenerife South Airport (TFS) to Golf del Sur? Can I use a Bono card for this trip? Many thanks in advance. Because of one way streets or the layout of the bus routes, you can find that buses for both directions may use the same bus stops, or you may have bus stops several metres apart but on the same side of the road. Can be confusing so double check the bus destination on the front of the bus. Hello.How to get from South Tenerife to Puerto de la Cruz?cheapest? Does titsa have a lost and found place? I am an electric wheelchair user. 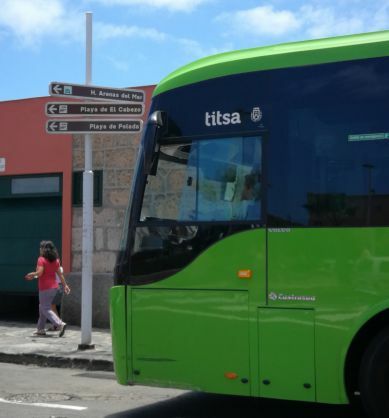 Are there accessible buses that go from Los Americas to puerto de la cruz? Thank you! It's the best time to make a few plans for the longer term and it's time to be happy. I've learn this publish and if I could I desire to recommend you some fascinating issues or advice. Perhaps you can write next articles referring to this article. I want to read even more things about it! I will be in the sentido Jacaranda hotel in Fanabe , Mon the 5 of march where do i catch a srvice bus to Loro Park.